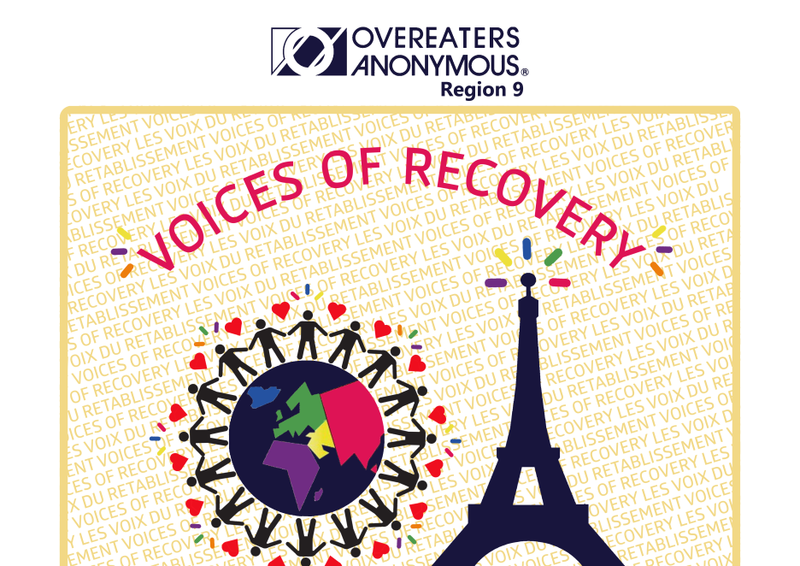 Download "OA REGION 9 ASSEMBLY & CONVENTION 2015"
1 OA REGION 9 ASSEMBLY & CONVENTION 2015 We invite you to come to the gathering of the many "Voices of Recovery" that will be heard and shared during this unique international meeting of Overeaters Anonymous. 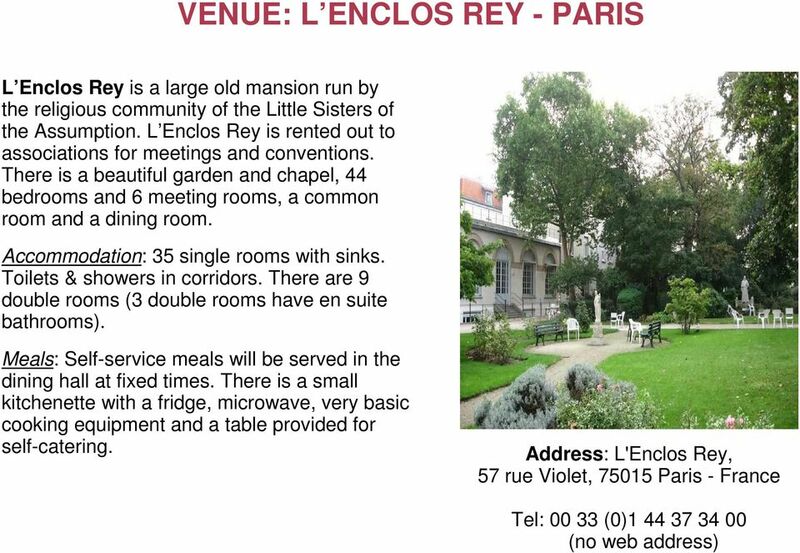 OA France is honoured to host the Region 9 Assembly and Convention in Paris, France. We invite all OA members of Region 9 and worldwide to join us and hear many individual voices in recovery within the unity of Overeaters Anonymous. You will find all you need to know about registering for and attending the Convention in this flyer. 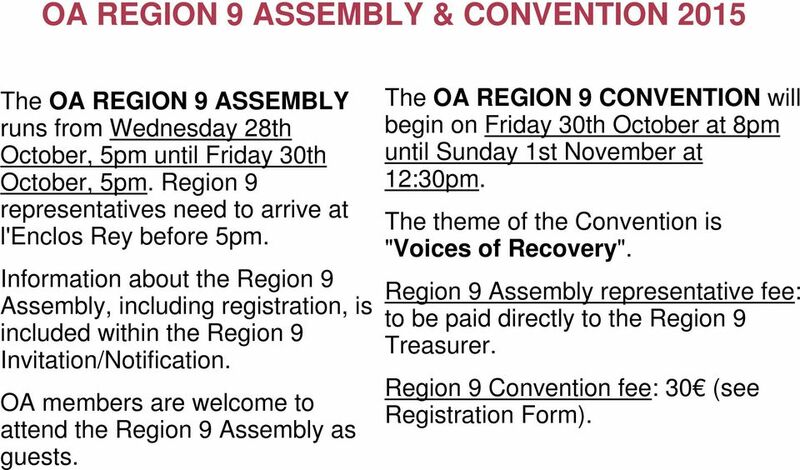 Details of how your service body can register for the Region 9 Assembly are included in the Region 9 invitation. 2 OA REGION 9 ASSEMBLY & CONVENTION 2015 The OA REGION 9 ASSEMBLY runs from Wednesday 28th October, 5pm until Friday 30th October, 5pm. 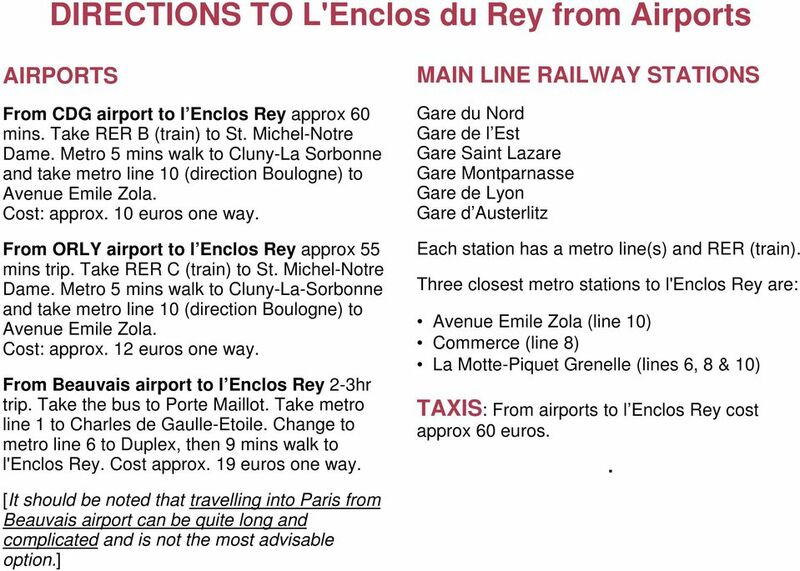 Region 9 representatives need to arrive at l'enclos Rey before 5pm. Information about the Region 9 Assembly, including registration, is included within the Region 9 Invitation/Notification. 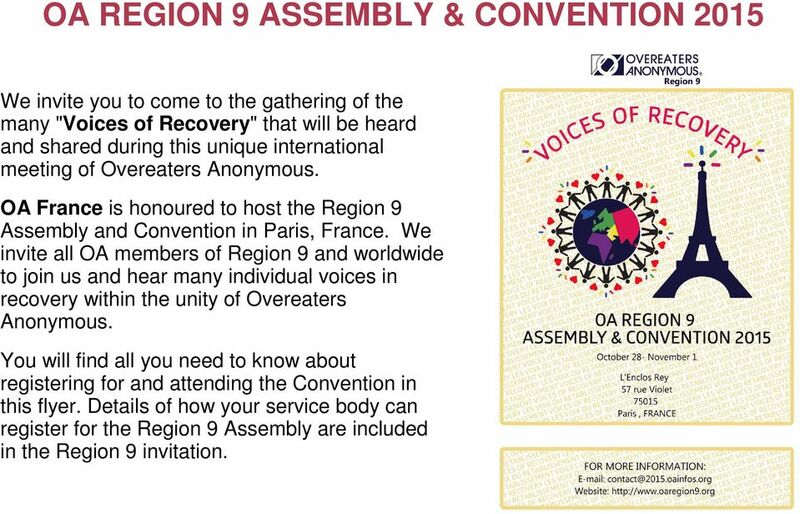 OA members are welcome to attend the Region 9 Assembly as guests. 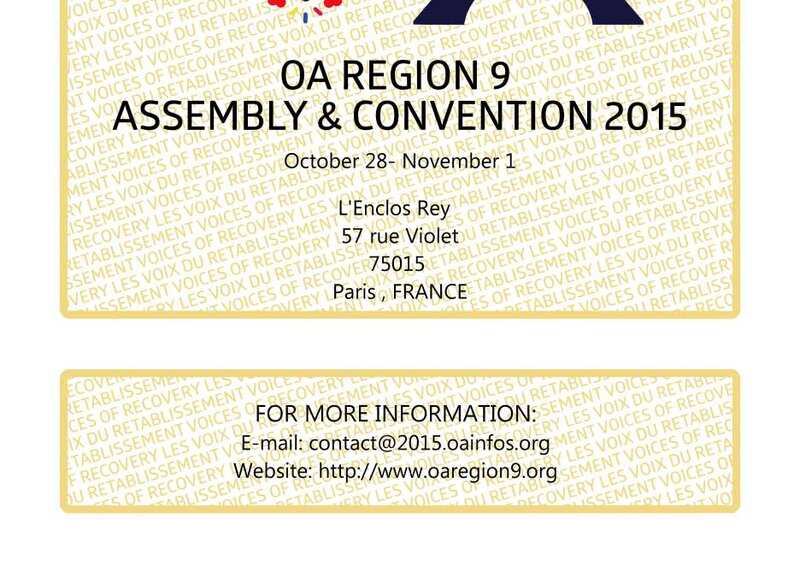 The OA REGION 9 CONVENTION will begin on Friday 30th October at 8pm until Sunday 1st November at 12:30pm. The theme of the Convention is "Voices of Recovery". Region 9 Assembly representative fee: to be paid directly to the Region 9 Treasurer. Region 9 Convention fee: 30 (see Registration Form). 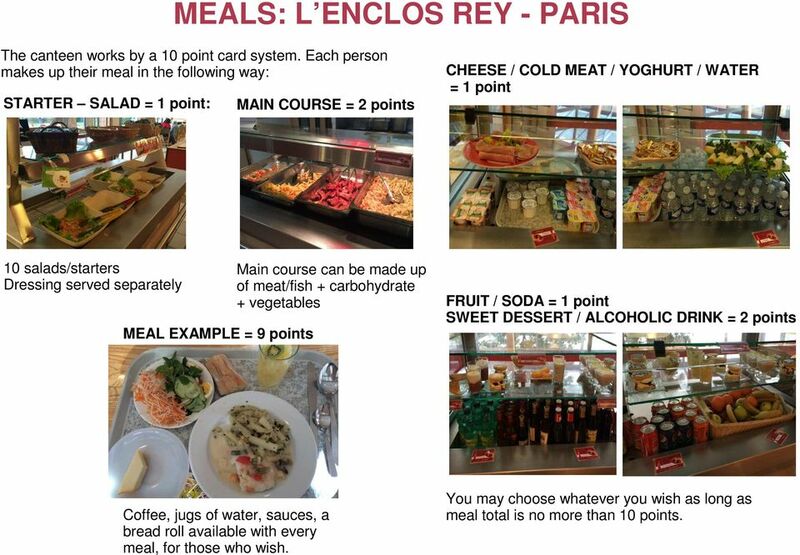 4 MEALS: L ENCLOS REY - PARIS The canteen works by a 10 point card system. Each person makes up their meal in the following way: STARTER SALAD = 1 point: MAIN COURSE = 2 points CHEESE / COLD MEAT / YOGHURT / WATER = 1 point 10 salads/starters Dressing served separately MEAL EXAMPLE = 9 points Main course can be made up of meat/fish + carbohydrate + vegetables FRUIT / SODA = 1 point SWEET DESSERT / ALCOHOLIC DRINK = 2 points Coffee, jugs of water, sauces, a bread roll available with every meal, for those who wish. You may choose whatever you wish as long as meal total is no more than 10 points. USEFUL INFORMATION. Enquiries. Map. For all enquiries please contact: - phone: +33 (0)2 40 29 15 37 - email: inio-inform2012@gensdevenement. HANDBOOK. There are soccer, volleyball grounds outside the Escandille resort, as well as an indoor swimming pool, sauna, a gym room and squash court. 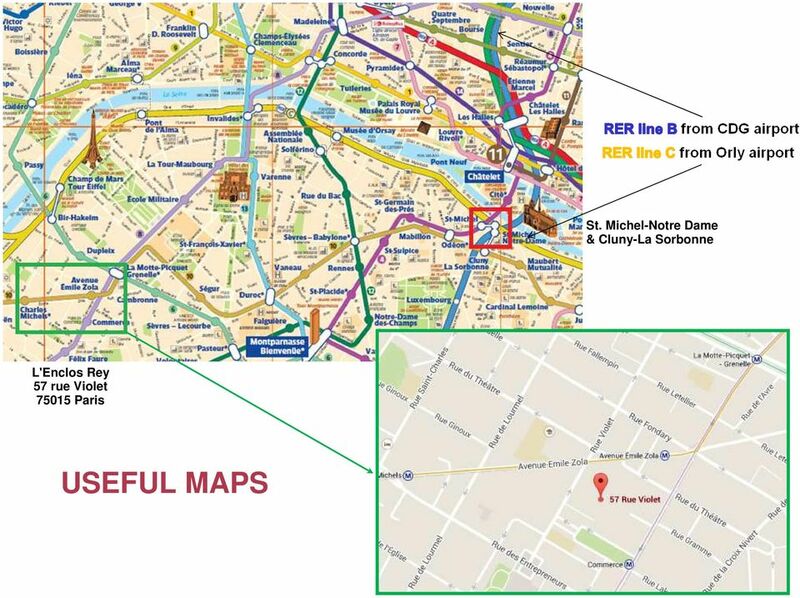 HOTEL GUIDE CHATELET LES HALLES. High season. Low season. Comments. Exhibition period. validity : 2008/01-01/12-31 B&B. Euros. Come to the Conference, become part of this very promising event, the highlight of this biennium in District 27! Ground Floor. Level -1. Carré du Patio. Liberty. Rochambeau Business Center. Lafayette 1. Terrace. Junior Ballroom. 4 5 Champollion. For further information or to discuss your individual needs please contact us on 01962 732518 or visit our website www.oldalresfordplace.co. The CoNFERENCE is getting closer! Welcome Home Badgers! Snow College Residence Life. Campus living puts you in the center of it all! Enjoy the convenience of a short walk to class and living in a safe, secure and affordable environment.